Puzzle #548 - Entangled Wires? Puzzle #540 - Phoebe's Phoebia! Puzzle #537 - Remember Caesar? To submit the solution to the latest puzzle, you need to log in to TestFunda and on the puzzle page click on Solution. You will get a form to submit the solution. Please note that you can submit the solution only between Friday and Monday. Solutions posted in the comments below or sent as stand-alone emails will not be considered for prizes. Miss Braganza once decided to play a game with her students in class, who were beginning to look bored. She asked a peon to get an overhead projector (OHP) and focused a transparency sheet on a screen on the whiteboard. On the transparency sheet was a grid. There were 9 numbers in shaded squares on the grid in such a way that there were 8 non-shaded squares around each number. The game was that a student should fill each of the non-shaded squares with a number from 1 to 7. The 8 numbers around the number in the shaded square should sum up to the shaded number. Also, no row nor column should contain a duplicate number in the non-shaded square. For example, the top row may be 1 2 3 4 5 6 7. 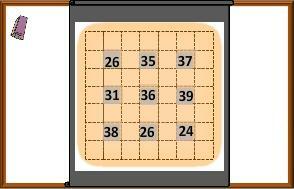 Fill in the non-shaded squares with appropriate numbers and complete the grid. We recommend that you do not see the solution unless you have solved the puzzle or you have spent a couple of sleepless nights attempting to do so! I want to see the solution .